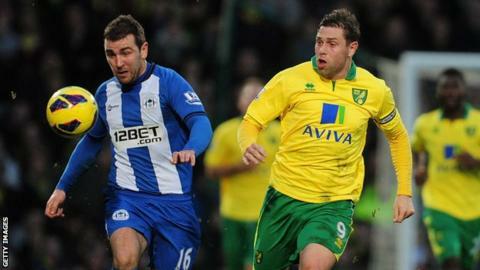 Wes Hoolahan's fine individual display helped Norwich beat Wigan 2-1 to extend their unbeaten league run to 10 games. The Irishman created one and scored another against a Wigan side who remain in the Premier League's bottom three. His hard work set up Anthony Pilkington to fire home at the near post after 15 minutes, before Shaun Maloney equalised with a long-range effort. Pilkington then turned provider as Hoolahan's emphatic header sent Norwich into the top half of the table. Norwich merited all three points today. That blistering strike from Anthony Pilkington put them in front, Shaun Maloney's equaliser gave Wigan hope, but Wes Hoolahan - who was terrific throughout - restored their lead. Norwich make it 10 Premier League games unbeaten - their best ever run. Ali Al-Habsi was terrific, but for him it would have been even more emphatic. Wigan remain in the relegation zone. Following an unbeaten run that goes back to the start of October, Norwich are now only two points shy of a place in the top four. Wigan were unable to reproduce their usual flowing style, and the first 15 minutes served up little by way of entertainment or goalmouth action. The only spark came from Hoolahan, who repeatedly dropped deep to find space in the congested midfield. After pleasing the crowd with a few flicks, the 30-year-old showed there was far more to his game than some pretty touches. Emerson Boyce dwelt on the ball too long before Hoolahan pounced and quickly spotted Pilkington's run down the pitch. His through-ball was magnificent, allowing the forward to take a touch before hammering his shot high past Ali Al-Habsi, who could only get a hand to it. Pilkington and Al-Habsi were the main protagonists in the remainder of the first half. First, the Norwich man blasted wide after the goalkeeper spilled a routine catch, then the Omani made amends with a magnificent one-handed save from Robert Snodgrass's header. Roberto Martinez brought on Shaun Maloney and David Jones at half-time for the injured James McCarthy and the ineffective Jordi Gomez. The double switch paid dividends almost immediately, as Maloney scored Wigan's first away goal since Ben Watson's winner at Tottenham on 3 November. James McArthur's neat ball out wide found Arouna Kone, who rolled the ball to the edge of the box. Maloney opened up his body and struck across the ball, angling it away from Mark Bunn and into the far corner. Buoyed by their equaliser, Wigan were enjoying their best period of the game. Mauro Boselli, making his first Premier league start since December 2010, had a decent chance but failed to convert Maloney's deep cross. Parity only lasted 13 minutes however, with Hoolahan grabbing a goal befitting his overall performance. Pilkington twisted away from Emmerson Boyce down the left hand side before finding Hoolahan, who perfectly guided his header past Al-Habsi in front of the watching Republic of Ireland assistant manager Marco Tardelli. The goal really calmed the home side down. As their midfield diamond sparkled, the Canaries were twice more denied by Al-Habsi, most impressively when he deflected Pilkington's close-range shot away with a strong right hand. Wigan did have one last chance though, when Kone went close in stoppage time. His effort was bravely blocked by Sebastien Bassong, but an equaliser would have been unjust on Norwich and Hoolahan. "It is not being negative, but for a club like ourselves, it is about keeping as big a gap as you can between us [and those at the bottom]. "There is no shame in saying that, it is a reality for clubs like ourselves. "But our form at the moment has deserved it. "We are a team which has to work very hard for the points we get, so there will be no getting carried away." "Our start was sluggish and pedestrian, we were very, very, poor and had our goalkeeper to thank for keeping us in the game. "The second half was very different, we started to control the game and Norwich had to start to defend. "We scored a beautiful goal and were starting to build positive momentum, so our disappointment is the smallest man on the pitch gets a free header in the six-yard box. "I felt with our second-half performance we merited something out of the game, but it was a self-inflicted defeat." "It is one of those actions you don't want to see. James McCarthy has been in good form, and they took him out of the game, which is very disappointing. "It is his ankle ligaments, we will X-ray it and get the results from the scans very shortly, but I doubt if he will be available for the next 10 days."